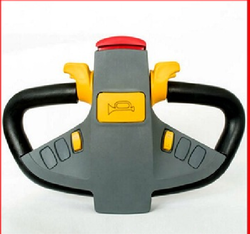 Attractive, ergonomic and practical function control handles used in pallet jacks, walkie-stackers and tow tractors. These control heads include an electronic throttle mechanism and an emergency switch, and may be equipped with a variety of functional options, including switches (horn, lift, lower, coast), throttle and instrumentation. Features: Ergonomic design maximizes vehicle and operator productivity while minimizing operator fatigue. Tiller head with proportional signals generated based on hall sensor technology. Tiller head with special type potentiometer. Compatible to all motor controls.